Though her "Greatest Hits... So Far!!!" CD is being released on November 16th, pop rocker diva P!nk is including a new single, "Raise Your Glass," which has blown up the airwaves and is currently #7 on the iTunes Top 100. 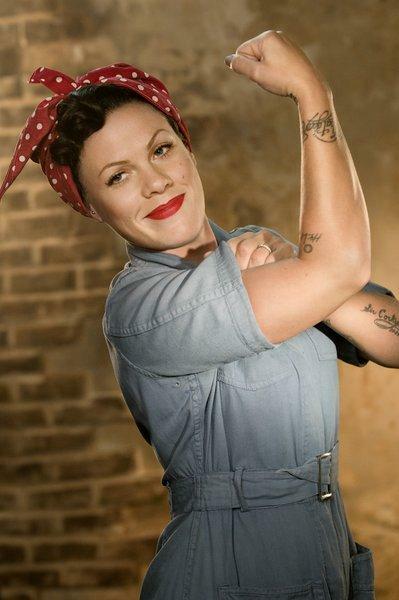 We all know P!nk is one tough lady, and this video does all it can to show that off: battling sumo wrestlers/Wall Street bankers, sleeping with clergymen (and women) and creating a breast milk farm to feed thirsty cows. Very tongue-in-cheek rebellious, for sure. Personally, I prefer the shots of the nerd rocking out at prom, the lonely girl raising her milk box in the cafeteria and, duh, P!nk playing at the gay wedding (is there a number I can call to arrange for that?!). To me, these scenes really capture the message and meaning behind the song—it's okay to be different. And isn't that one of the most worthwhile messages, especially these days? I'll raise a glass to that*! Side note: can I get a pair of those thick-rimmed glasses, please? * - Yes, I went there with that pun. Just let me.